Any recorded testimony of Mengelberg is invaluable, any recorded testimony of Mengelberg in “contemporary” (from his time) music is even more (and among those, the recording of the world premiere of Bartok’s Violin Concerto with Szoltan Szekely in 1939 is a treasure deserving to be kept in Fort Knox), and any recorded testimony of Mengelberg in obscure Dutch music of his time is not just invaluable but invaluably rare. Among those for which we have recordings, very few have stepped above the status of local glories (and even then, only with connoisseurs of the off-the-beaten track): Julius Röntgen (1855-1932) and Johan Wagenaar (1862-1941) may qualify (the latter, thanks to the advocacy of Riccardo Chailly when he was one of the successors of Mengelberg at the helm of the Amsterdam Concertgebouw Orchestra, Decca 425 932-2 (1990), barcode 028942583320). Speaking of Dutch composers brought to the attention of the international public thanks to the advocacy of Chailly, one is surprised not to find any Diepenbrock in Mengelberg’s recorded legacy, live or studio. But a check on the great online archive of the Concertgebouw Orchestra, listing all the concerts given by the orchestra since the end of the 19th century, shows that this is due only to the fortunes and mis-fortunes of recording in an era when it wasn’t as common as today. Mengelberg performed a lot of Diepenbrock in concert. But Cornelis Dopper (1870-1939) and Rudolf Mengelberg (1892-1959) are now all but forgotten, even in their own country (even though Chandos published two CDs of symphonies of Dopper in the early 2000s, Chandos 9894 barcode 095115988428 and 9923 barcode 095115992326), and it is even the case with Hendrik Andriessen (1892-1981), very popular with the Concertgebouw Orchestra from 1933 to 1980, but who now seems to have been completely overshadowed by his son Louis. 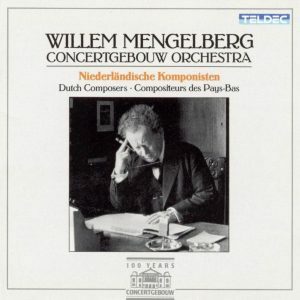 Rudolf Mengelberg was Willem’s nephew (or grand nephew, sources diverge), also a composer and musicologist, and he was the Concertgebouw’s chief executive in the 1930s. Teldec could have been more helpful by providing the exact sources of these recordings – King Record does, although, in truth, I hadn’t noticed the fine print at the bottom of their back cover until after I had done my own detective work. All these are all studio recordings, all originally published on Telefunken 78 rpms. Dating found on CDs or online is sometimes contradictory, but the best source I’ve found for elucidating these matters is a great online Mengelberg discography (link will open a .pdf document in a new tab). 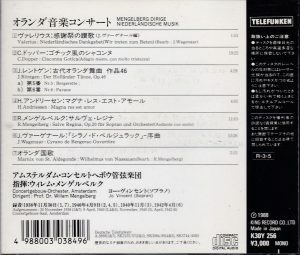 Valerius/Wagenaar “Niederlängisches Dankgebet” (track 1) and what is credited (but about this see further) as Marnix von St. Aldegonde’s Wilhelmus von Nassauen in an arrangement said to be by Rudolf Mengelberg (track 7), were recorded on December 1, 1938 (but the CD and other Mengelberg discographic sources say 30 November) and originally published on Telefunken A 2899 (10”) or NK 1965 (12”). 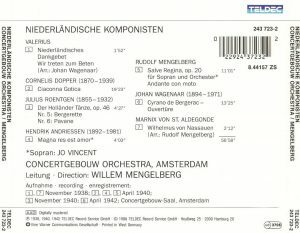 Three compositions were recorded on 12 April 1940 (CD indicates 9) : Dopper’s Ciaccona Gotica (Telefunken SK3155/7), Hendrik Andriessen’s Magna Res est amor and Rudolf Mengelberg’s Salve Regina op. 20 (Telefunken SK3084/5), the two latter with soprano Jo Vincent. Finally Wagenaar’s Cyrano de Bergerac Overture, from 16 April 1942, came on Telefunken SK3744/5. It took me some research to establish for sure what exactly were the so-called Valerius “Niederländisches Dankgebet” and its arrangement by Johan Wagenaar. Wikipedia gives an answer to the first question, as well as the piece’s original title in Dutch: “Wilt heden nu treten” (We Gather Together): a Christian hymn written by Adrian Valerius in 1597 to celebrate a Dutch victory against Spain, found in his collection of folk poems and melodies “Nederlandtsche gedenck-clanck”. Wikipedia adds that “the German translation of his most familiar song Wilt Heden Nu Treden (known in English as We Gather Together): Wir treten zum Beten or Altniederländisches Dankgebet (Old Dutch Thanksgiving Prayer), became a potent symbol of the “Throne and Altar” alliance of German civil religion until 1918. In the United States, it is popularly associated with Thanksgiving Day and is often sung at family meals and at religious services on that day, having been brought to America by Dutch settlers in New Amsterdam, now New York City”. The Concertgebouw archive shows that the piece had been performed a number of times by the orchestra under various conductors since 1898 (already Mengelberg then), but it must not have been in Wagenaar’s arrangement, since records show a Waagenar arrangement for small orchestra dating from November 1938, see this .pdf document, p. 16/33 (will open in a new tab). Which seems to imply that he made it specifically for the recording, which took place the month after.The piece was apparently dropped from the orchestra’s concert repertoire after 1934, and the last time it was performed was on 10 December 1949, and it was Eduard van Beinum conducting then. In the Concertgebouw’s archive the piece listed as “Wilhelmus” is always attributed to composer “none”, e.g. anonymous. Certainly: also known as “Wilhelmus van Nassouwe” or “Het Wilhelmus”, it is the Netherlands’ national anthem, and “Marnix von St. Aldegonde” is the (disputed) author of the lyrics. Again, see Wikipedia the free fountain of universal knowledge (but they won’t turn down your donations) for more. Teldec credits “R. Mengelberg” for the arrangement and many online sources have reproduced that info, but I don’t think this is true: the label of the original 78s on Telefunken NK 1965 clearly indicates: “bewerking: Prof.Dr. 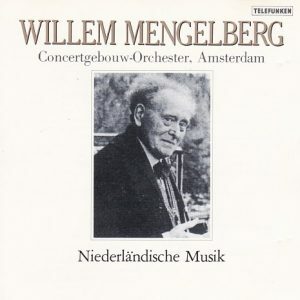 Willem Mengelberg”. See on YouTube. And, other than in reference to this recording, I’ve found no trace online that Rudolf had ever written an arrangement of Wilhelmus. Incidentally, on the 78s label, Valerius is also credited as the original composer, and indeed he transcribed the song in his “Nederlandtsche gedenck-clanck” and also made a choral arrangement in his collection of Church Canticles and Hymns (Liedboek voor de Kerken), but the melody was not his own invention. A lot of fact-checking for little substance: the anthem is a patriotic-bombastic parade and the Thanksgiving hymn sounds inconspicuous like a harmonized hymn. As interesting as it is to have those testimonies of Mengelberg in rare Dutch repertoire, little of this is truly interesting. Julius Röntgen’s two Ancient Dances from the Netherlands (“Oud-Nederlandse dansen”, op. 46a) sound like harmonized Renaissance dances, one wistful, the other merry, something George Auric might have composed for a film in the 1930s or 1940s. Hendrik Andriessen’s Magna Res est amor is “interesting” only for sounding like a Verdi aria. It was written in 1913 (with organ accompaniment, and orchestrated in 1919), and after all Verdi had passed only 12 years before (and make it 20 years since his last opera, Falstaff). Johan Wagenaar’s Cyrano de Bergerac Overture op. 26 from 1905 sounds like a crossbreed of Puccini and Strauss’ Till Eulenspiegel. Entertaining, but not original. This leaves Rudolf Mengelberg’s Salve Regina for soprano and orchestra (stylistically somewhere between Puccini’s Tosca and the more pastoral Honegger, extremely lyrical and quite taking I find; incidentally, the composition had been premiered by Mengelberg on 15 December 1934, already with Jo Vincent) and Cornelis Dopper’s superb Ciaconna Gotica from 1920, starting in a somber and brooding atmosphere somewhat reminiscent of Vaughan Williams’ Tallis Fantasia, but traversing many moods, and with great orchestral invention. The sonics are good enough for the vintage, which still means that you get surface noise and scratches. These pieces call for stereo recordings. I’m aware of only one for Dopper’s Ciaconna, from 1995, by Kees Bakels and the Netherlands Radio SO, on NM Classics 92060 with the same composer’s 7th Symphony “Zuidezee” and Peter Van Anrooy’s Piet Hein Rhapsodie (1995), barcode 8713309920604. TT 57 minutes. Note (and beware) that the same Teldec CD is listed on many commercial websites including the Amazons of all countries under barcode 0022924415722. This seems highly doutful to me. Resarch shows that this barcode is for Teldec 244 157-2, a CD of T Rex / Marc Bolan. See here. Of related interest and for a possible complement, see my review of The Mengelberg Edition vol. 13: Voormolen, Dopper. Archive Documents ADCD 119 (2001).